Coal power is a rather simple process. In most coal fired power plants, lumps of coal are crushed into fine powder and are fed into a combustion unit where it is burned. Heat from the burning coal is used to generate steam that is used to spin one or more turbines to generate electricity. The concept of burning coal that has been pulverized into a fine powder stems from the belief that if the coal is made fine enough, it will burn almost as easily and efficiently as a gas. The feeding rate of coal according to the boiler demand and the amount of air available for drying and transporting the pulverized coal fuel is controlled by computers. Pieces of coal are crushed between balls or cylindrical rollers that move between two tracks or “races.” The raw coal is then fed into the pulveriser along with air heated to about 650 degrees F from the boiler. As the coal gets crushed by the rolling action, the hot air dries it and blows the usable fine coal powder out to be used as fuel. The powdered coal from the pulveriser is directly blown to a burner in the boiler. The burner mixes the powdered coal in the air suspension with additional pre-heated combustion air and forces it out of a nozzle similar in action to fuel being atomised by a fuel injector in modern cars. Under operating conditions, there is enough heat in the combustion zone to ignite all the incoming fuel. In 1884, an efficient high speed steam turbine was developed by British engineer Charles A. Parsons which replaced the use of steam engines to generate electricity. In the 1920s, the pulverized coal firing was developed. This process brought advantages that included a higher combustion temperature, improved thermal efficiency and a lower requirement for excess air for combustion. In the 1940s, the cyclone furnace was developed. This new technology allowed the combustion of poorer grade of coal with less ash production and greater overall efficiency. Presently, coal power is still based on the same methods started over 100 years ago, but improvements in all areas have brought coal power to be the inexpensive power source used so widely today. Cyclone furnaces were developed after pulverized coal systems and require less processing of the coal fuel. They can burn poorer grade coals with higher moisture contents and ash contents to 25%. The crushed coal feed is either stored temporarily in bins or transported directly to the cyclone furnace. The furnace is basically a large cylinder jacketed with water pipes that absorb the some of the heat to make steam and protect the burner itself from melting down. A high powered fan blows the heated air and chunks of coal into one end of the cylinder. At the same time additional heated combustion air is injected along the curved surface of the cylinder causing the coal and air mixture to swirl in a centrifugal “cyclone” motion. The whirling of the air and coal enhances the burning properties producing high heat densities (about 4700 to 8300kW/m2) and high combustion temperatures. The hot combustion gases leave the other end of the cylinder and enter the boiler to heat the water filled pipes and produce steam. Like in the pulverized coal burning process, all the fuel that enters the cyclone burns when injected once the furnace is at its operating temperature. Some slag remains on the walls insulating the burner and directing the heat into the boiler while the rest drains through a trench in the bottom to a collection tank where it is solidified and disposed of. This ability to collect ash is the biggest advantage of the cyclone furnace burning process. Only 40% of the ash leaves with the exhaust gases compared with 80% for pulverized coal burning. Cyclone furnaces are not without disadvantages. The coal used must have a relatively low sulfur content in order for most of the ash to melt for collection. In addition, high power fans are required to move the larger coal pieces and air forcefully through the furnace, and more nitrogen oxide pollutants are produced compared with pulverized coal combustion. Finally, the actual burner requires yearly replacement of its liners due to the erosion caused by the high velocity of the coal. The largest single use of coal in the steel industry is as a fuel for the blast furnace, either for the production of metallurgical coke or for injection with the hot blast. The requirements of coals purchased for coke making are much different from those used in other processes. Only a certain class of coals possessing very specific properties and composition are suitable for the making of a quality coke for blast furnace use. Coke is produced by heating particulate coals of very specific properties in a refractory oven in the absence of oxygen to about 1100 C (2000 F). As temperature increases inside the coal mass, it melts or becomes plastic, fusing together as devolatilisation occurs, and ultimately re-solidifies and condenses into particles large enough for blast furnace use. During this process, much of the hydrogen, oxygen, nitrogen, and sulphur are released as volatile by-products, leaving behind a poorly crystalline and porous carbon product. The quality and properties of the resulting coke is inherited from the selected coals, as well as how they are handled and carbonised in coke plant operations. In terms of coal properties, coke quality is largely influenced by coal rank, composition (reactive and inert macerals and minerals), and an inherent ability when heated to soften, become plastic, and re-solidify into a coherent mass. Bituminous class coals of high, medium and low volatile rank possess these properties, but not all produce a coke of desirable quality and some even may be detrimental to coke ovens. To compensate for the lack of individual coals with all the necessary properties, blends of anywhere from 2 to 20 different coals are used in today’s coke making operations. These coal blends must be managed to optimise coke quality and reduce the cost of raw materials. Individual coals and coal blends need to have the proper proportions of reactive and inert components, must have a relatively low concentration of alkalis-containing minerals, low ash and sulphur yields and be sufficiently thermoplastic to bind all of the components together. At the same time they must provide a level of contraction that will allow the coke mass to be easily removed from a coke oven. Carbon from either coke or coal can be used in the raceway zone of the blast furnace to generate some of the energy and reducing gases needed to reduce iron oxides, preheat the burden and produce molten metal and slag. In the 1960’s, U.S. Steel Corporation began evaluating the technological feasibility for the injection of pulverized coal into the blast furnace as a means of reducing coke rate and hot metal costs. In these early tests it was found that coke rates could be reduced 36% by injecting 230 kg of coal/metric ton of hot metal without enriching the oxygen content of the hot blast. With oxygen enrichment a further reduction of coke rate to 48% could be obtained by injecting 290 kg of coal/ metric ton of hot metal. At the beginning of the 1990’s blast furnace injection of coal became the rule rather than the exception as injection rates reached 200 kg of coal/metric ton of hot metal in Europe and Japan. Generally, coal injection systems consist of a grinding mill that is capable of reducing and drying the 50 x 0 mm raw coal in one step to a particle-size range acceptable for distribution and injection. Waste gas from the blast furnace can be used in drying operations to reduce cost, but natural gas systems have also been used. Furthermore, an inert atmosphere should be employed to mitigate the potential for fires and explosions of dry coal particles. 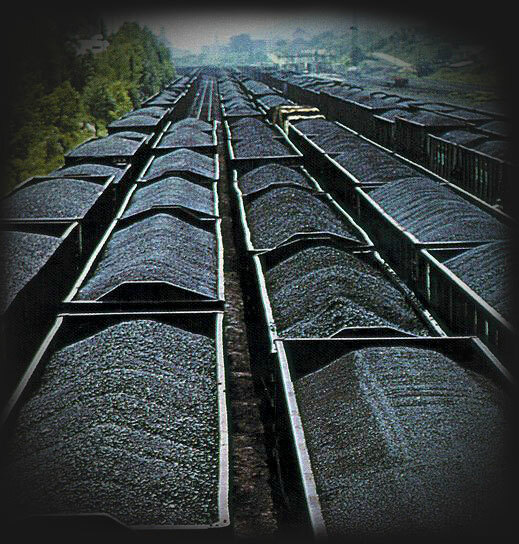 Two processed coal size specifications are used, a granular system where coal is ground to 95% minus 2 mm (10 mesh) and 20 % minus 0.075 mm (200 mesh), or 100% minus 2 mm and 80% minus 0.075 mm. After crushing, the gas and coal are separated in a cyclone and bag filter system from which the pulverized coal is sent to storage for injection. The coal preparation system represents two thirds of the total capital cost of a coal injection system. A wide variety of non-coking coals have been tested for injection, ranging from lignite to bituminous coals and anthracites. The choice depends on price and availability rather than attaining the highest injection rates or coke replacement. In light of the diversity of coals that have been used, if all other considerations were equal (raw materials, transportation cost, and availability of tonnage), the level of ash yield, followed closely by volatile matter and moisture content and a coal’s grindability are the most important properties. The yield of ash from a coal should be minimized, but practically speaking should be less than 10%. Ash contributes non-combustible components to the blast furnace burden, has been shown to lower flame temperature and makes grinding difficult. Along with this goes the need to select a coal that contributes a minimal amount of sulfur and alkali content. Volatile matter should be maximized to the extent possible as it has been found that low volatile content coals do not combust completely in the raceway. This is advantageous to reduce possible carryover of particulate materials in the off gas of the blast furnace. However, high volatile content coals generally have higher moisture contents. Moisture should be minimised as additional energy will be needed for its removal in the blast furnace. It also contributes to difficulties during grinding and to problems of free flow from storage bins. Coal hardness, as measured by Hardgrove grindability, should be minimized for the efficient operation of the grinding mills. This approach reports the calorific value on a moist, mineral-matter-free basis and volatile matter and fixed carbon on a dry, mineral-matter-free basis. Implicit in this characterization is the fact that the amount of moisture, yield of ash and total sulfur must be measured to obtain the correct basis of comparison. Calorific Value varies linearly with increasing rank from subbituminous to medium volatile bituminous rank and then becomes unreliable. Volatile matter content on the other hand is quite variable until medium volatile rank and then changes sufficiently to become a good measure of the degree of coalification through anthracite coals. Another very important rank parameter that is useful in the characterization of coking coals is the measurement of the mean maximum vitrinite reflectance. This analytical technique is sensitive, persistently changing throughout coalification and is particularly important for accurately measuring minor differences in those coals used for coke making. The technique measures the amount of incident light reflected from a polished surface of the main component of coal, vitrinite. Vitrinite is that component of coal principally derived from woody tissues and represents the dominant component. Rank is the most fundamental concept relating both coalification history and utilization potential of a coal. Volatile matter and maximum vitrinite reflectance are important values used to determine the worth of coking coals. However, because volatile matter is dependent on both rank and composition, coals of different composition may be assigned to the same rank value even though their levels of maturity may differ. Coal is composed of the sum of all the organic vegetable matter preserved and buried as peat. There are three main groups of materials that constitute coals and that are used to define coal type. These material groups identified under an optical microscope in reflected white light are referred to as vitrinite, liptinite and inertinite and are composed of individual constituents called macerals. The three maceral groups are characterized by materials that belong together because of their similar origin or mode of preservation as well as by their gross chemical composition. With regard to coke making, vitrinite macerals constitute the principal reactive components of a coking coal. That is, during heating in a reducing atmosphere, vitrinite will become plastic, devolatilise and then solidify to form the porous, carbonaceous matrix of a metallurgical coke. Liptinite macerals are also highly reactive during coke making, but owing to their higher volatile content they contribute more to the by-products than to the coke product. Inertinite macerals are basically inert during the carbonisation process, as they do not possess or have only limited thermoplastic properties and volatile contents. However, they do serve a very important function as a filler phase for the other reactive macerals of coal. Small-size inertinite particles thicken the walls between vacuoles in coke thus improving the overall strength of the coke. Coal grade is a term used to indicate the value of coal material as determined by the amount and nature of ash yield and the sulphur content following the complete oxidation of the organic fraction. Calorific value is one of the principal measures of a coal’s value as a fuel and is directly influenced by mineral impurities. Most of the ancillary mechanical and physical tests used to characterize coals were developed to identify coal for coke making. The unique property that sets coking coals apart from other coals, is caking ability. There has been much effort to characterize the swelling, contracting and thermoplastic properties of coals using techniques that allow for the comparison of different coals and how these properties influence coke production and quality. Laboratory tests such as the crucible or free swelling index, Gray-King coke type, Roga Index, Audibert-Arnu Dilatometer and Gieseler Plastometer, provide some means of evaluating the relative strength of swelling, degree of contraction and how fluid a coal will become under heating conditions similar to those encountered during coke making. Another important mechanical test designed to provide a measure of the ease of pulverization of a coal in comparison with other standard reference coals is the Hardgrove grindability index, (HGI). Ease of grinding is an important economic consideration for all industrial processes. Grindability changes with coal rank, i.e., coals of very low and very high rank are more difficult to grind than middle-rank coking coals. Other factors that influence HGI include the presence of different maceral components, the presence of even small proportions of hard minerals (like quartz) and variations in moisture content. Of these factors, changes in inherent moisture content cause the most variation in the HGI index, particularly for lower rank coals.